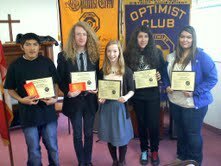 The Optimist Club of Salem honored five students at Youth Appreciation Day on December 9. Recognized for achievement in fine and performing arts were Derrick Holmes, Nick Bailon, Abby Brockamp, Rosita Olaide and Brandon Conrad. The Salem Optimist Club shared the following story about the students on their Facebook page . Paul Negstad, chairperson for youth appreciation for many years, shared the emcee role with club president Calvin Steck. Three boys and two girls received plaques and a cash award at the ceremony's conclusion. Senior Derrick Holmes of Chemawa Indian School is a member of the Hopi tribe in Arizona. He sings and dances with a performing arts group, and also is a student lead in his second year at Chemawa. Derrick intends to attend Arizona State University, major in engineering or architecture and then return to his tribe. McKay's honoree, Nick Bailon, is a sophomore who both plays cello and makes pottery. His first chair in botht eh McKay and Salem Youth Symphony Orchestrats. Called "an original thinker" by his potter teacher, Nick is in four advance-placement classes. His mother, Lisa Garcia, joined Nick at the luncheon. Abby Brockamp of North Salem has won first place two years running in district choral competition. A junior, Abby is a soprano who sings in her church choir and directs a choir at girls camp. She is vice president of Norths' Concert choir. Abby's mother, Tammy, was a luncheon Guest. "She is the embodiment of our choir program." That's how Spraque senior Rosita Olaide was described by directory David Brown. Rosita told the luncheon crowd that she wants to go to Chemeketa Community College and study psychology. At some point, Rosita added, she plans to take over her parent's business, which is a prison drug and alcohol treatment consulting firm. Brandon Conrad, a senior at Western Mennonite School, told luncheon attendees that he participates in every musical thing at the school. For example, Brandon is in the Jazz band, a cappella choir, and the lead in a musical. Brandon heads the worship team in chapel and he plays the guitar as well as the bass and piano. He is hoping to attend Seattle Pacific University and major in music.